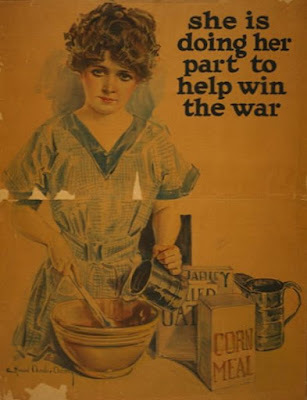 Even in a war, a woman's contribution has it' place- in the kitchen. At the “International Conference on Gender, Work and Society” held on April 22nd – 23rd, 2017, the keynote speaker, Dr. Edwina Pio, spoke about how patriarchy can sometimes be beneficial for society. She gave the example of a woman opening her own business and seeking help from her husband in managing its finances. She was perhaps implying that a woman asking a man for help supports patriarchal norms, since it puts a man in a position of authority; but that accepting, or even utilizing, this unequal power relationship can help the woman. This statement was immediately contested by Dr. Farzana Bari, a women’s rights activist. Dr. Bari claimed that the definition of patriarchy used by the speaker was incorrect, and that it is necessary that the entire social setup of patriarchy be condemned. The tenets of the patriarchal system that we live in are so deeply ingrained in our individual mindsets that it is dangerous to purport them in any way. Irrespective of how the term is defined, the idea that power and decision making lies with men is at heart of all the issues related to women in our society, and is a major impediment to women’s empowerment. This work starts with women’s own home. The household is the most fundamental social unit in most developing countries. No matter how empowered women may be outside of the home, if they are unable to make their own decisions in their own households because the power lies with a male figure, women’s empowerment cannot be achieved. If a girl has had the opportunity for equal education at an institution, this means little if she is not allowed to leave her house. There are many domestic hurdles that women have to navigate on a daily basis. One such hurdle described in the conference was that often, women cannot leave the house because they have to make fresh chapatti for their family on time for each meal. Many men refuse to eat precooked chapatti, meaning women are time-bound and cannot choose to do what they will with their own time (be that going out, working, or educating themselves). Policy making needs to focus on changing the mindsets of both men and women. We need to raise boys who grow up to respect women. We need to raise girls who are confident and can assert their rights. This change can come only through working to change internalized mindsets of “appropriate” gender roles. Such a change would remove not only domestic, but also external hurdles to women’s empowerment because these very people will go on to become the policy makers, the bosses and the vehicles to convene women’s empowerment.